← Sixties Recipes – Remember These? Obamacare: What do you know about it? Is it a mystery to you, with all 2,800 pages that nobody can really manage to get through? Have you found it already implemented to some degree in your life, and has it made a difference? 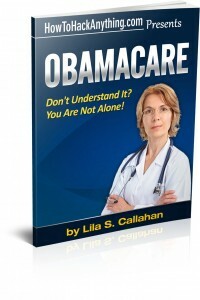 I am very happy to see a new booklet available concerning Obamacare on Amazon’s Kindle site today. Even at its full price, it’s not expensive, but today (October 3) it’s a free download. The author lays out the timeline of what has already happened in this sweeping legislation, and what is yet to come. She talks about the benefits, the drawbacks, how many people don’t really understand all the possible intended and unintended consequences. There’s some discussion about how the rhetoric gets so heated and so ugly (but I’m thinking: that’s just politics – people get really ugly when it comes to political topics). As we get older and often more in need of health care, the topics of who is going to pay and how much can be overwhelming – sometimes (actually more frequently than not) the answers aren’t clear. As we move forward, the amounts paid by each party (insurance and individual) change. This book, in the timeline, highlights the changes to come. I thought I’d share the Table of Contents below. If you go to Amazon, don’t forget that you can use the “See Inside” feature to get an idea of how the book is laid out. It certainly is worth reading for free, and, the price will be $6.95 , if you don’t happen to pick it up on the free day. So, head over to Amazon now and pick up a copy of Obamacare: Don’t Understand It? You are Not Alone!